Last week at GDC, American McGee took the stage to debut a brand spanking new trailer for Alice: Madness Returns, before allowing those in attendance a chance to try the game out. Many have heard of the original American McGee’s Alice, but honestly, few have actually played it. So for the vast majority, Alice: Madness Returns will be the introduction for the series. The story is set in both Victorian England ten years after the events of the original game, and in Wonderland, which has grown twisted and broken to match Alice’s psyche. Alice is currently the resident of an asylum following the horrific death of her parents, and the world she used to escape to has been shattered by the events in her real life. To reclaim her sanity and escape her predicament, Alice returns to Wonderland to help free the citizens and discover the truth behind her parents’ deaths. In the demo shown in San Francisco, the game is a somewhat traditional hack and slash title, but with a few twists. Alice will carry several weapons, and each is necessary in order to progress. Her primary weapon is the vorpal blade, but along the way she will also find giant hammers to destroy barriers, and even the odd machine gun among others. Close quarter combat is the primary focus, and a dodge function will be instrumental in surviving. The controls are tight and responsive, and fighting multiple enemies at once is fairly intuitive. There is also an emphasis on platforming, and the Alice’s jumping abilities will be put to the test repeatedly. Alice: Madness Returns is a game in the vein of God of War, but with a slightly less significant emphasis on the combat, and more on the environment. It is still too early to tell how it will all meld together, but what the demo showed seems promising. 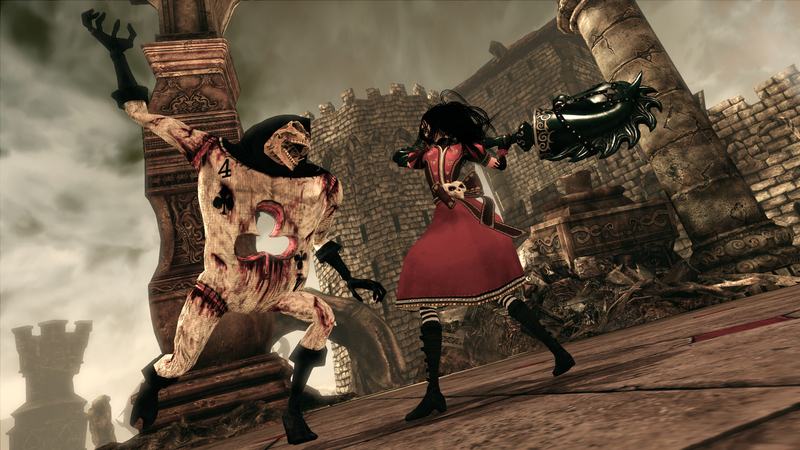 Check out the trailer below, and look for Alice: Madness Returns on PC, PS3 and 360 on June 14.